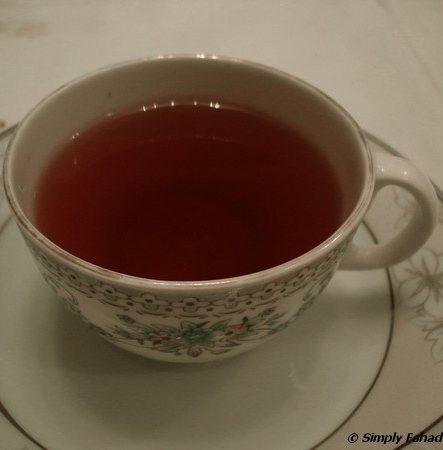 Liquid Friday: Nimbu Chai - Simply Fahad-istic! Tea has zero calories unless milk or sweeteners are added.Hence,it is much more healthier than other beverage options such as sodas or shakes. With 'Nimbu' meaning lemon,and 'Chai' meaning tea,this hot Indian beverage will win your heart with its refreshing sweet and sour taste.The mellow sweetness of honey is paired with the citrusy sourness of lemon juice in a drink that comes across as a blessing when you have run out of milk,or if you are lactose intolerant.Or if you are NOT lactose intolerant! Take the water and aromatic green cardamom,if using in a vessel and bring to a boil on high heat. Once the water reaches a boil,add the tea leaves/tea powder along with honey,and switch off the heat.Let the tea brew for a minute. In the meanwhile,put lemon juice in two teacups. Strain tea into the teacups,stir well and sweeten with sugar if required. Substitute the green cardamom with 1/2" piece of roughly chopped ginger and 1 black peppercorn.Simmer for five minutes before bringing it to boil on high heat and proceed as instructed.